Green Builder Media Takes Vegas By Storm! If you’re planning to be in Las Vegas—or anywhere nearby—on February 17-21, you don’t want to miss Green Builder Media’s incredible lineup of festivities! From a gala dinner celebrating the most innovative green building professionals to a knockout roster of global leaders during our Sustainability Symposium 2019 to the smartest net zero prefab house you’ve ever seen, we’ll will have something for everyone. Green Builder Media is gearing up for one incredible week in Las Vegas—February 17-21, 2019 will be chock-full with ideas, inspiration, and plenty of fun! The festivities begin on Sunday, February 17 with a gala dinner at the exclusive Mr. Chow in Caesars Palace, as we celebrate our 11th annual Home of the Year and Sustainability Award winners. These recipients represent the industry’s most authentic, advanced, beautiful and sustainable projects—and the professionals who have designed and constructed them. 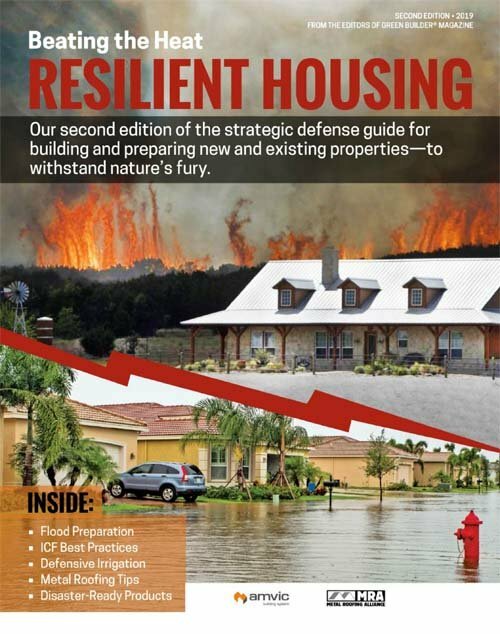 Download Green Builder’s awards issue for in-depth articles about all of the winners. On Monday, February 18, Green Builder Media will host the Sustainability Symposium 2019: The Desert Shall Bloom at the Artemus W. Ham Concert Hall on the UNLV campus. With a star-studded lineup of luminary presenters, the Sustainability Symposium 2019 will tackle critical climate change topics, from global economic stability to national security to water to clean energy. Check out a recent iHeartRadio radio spot with more information about the Symposium’s stunning agenda. Space is limited and by reservation only, so click here to register for the Sustainability Symposium 2019 today! We’re offering two free tickets to the Symposium—it is Vegas, after all, so if you’re feeling lucky, try your hand and enter to win. And I would be remiss if I didn’t offer sincere appreciation to our generous sponsors—Samsung, Ingersoll Rand, Emerson, Andersen, Owens Corning, Uponor, Rheem, and Caesars Entertainment—for helping to make the Symposium possible. But we’re not done yet! 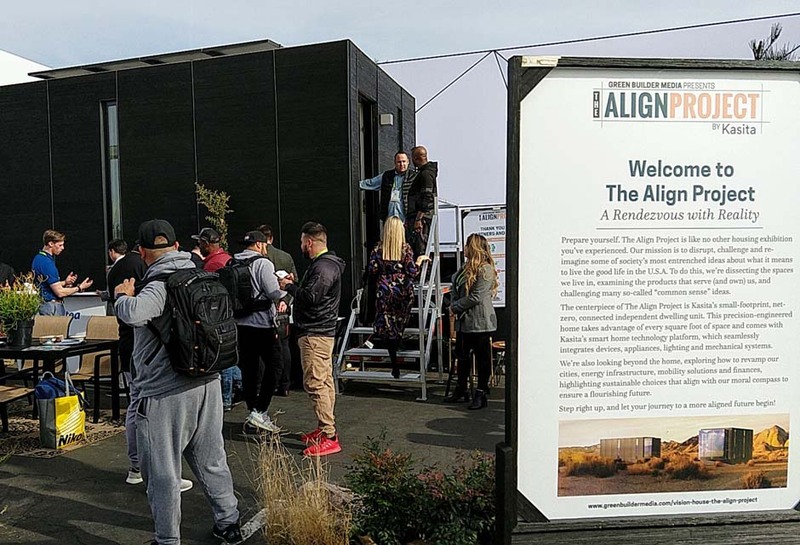 On Tuesday, February 19 through Thursday, February 21 at Design & Construction Week, Green Builder Media will showcase The Align Project—a stunning example of net-zero, small footprint, intelligent living, with the smartest home and mobility technologies all under one roof. If you join us on Tuesday, February 19 from 9:30am-11:30am, we’ll not only give you a personal tour of The Align Project, we’ll load you up with high-octane coffee and delicious organic breakfast treats! RSVP today to the breakfast event and we’ll pre-warm a mug for you. While with us at The Align Project, you can talk with the Green Builder Media team and our partners—including innovative companies like Rheem, Jinko Solar, Toyota, DuPont, Tabuchi Electric, Andersen, Viega, Rockwool, Loxone, Delta Electronics, FLO by Moen Corian Design, Trex, and Voltea—about the convergence of sustainability and technology in a right-sized-home that challenges entrenched ideas about how we live. Got questions about any of the festivities? Write to me at sara.gutterman@greenbuildermedia.com.